Though some of the concepts in this course are still relevant, overall this course does not reflect our current course standards. We now recommend you take the Complete Intro to Web Development, v2 course. Mark Boas introduces himself and describes his background using media on the web. He also gives a brief history of HTML5 media and introduces many of the core concepts. Before any HTML5 audio or video can be used, you need support. Mark summarizes the current browser support matrices for both audio and video. There are a few different types of audio and video containers. These containers hold different codec that are supported in browsers. Mark demonstrates how to add audio and video to a webpage and specify different media containers. Mark shows how to implement a simple HTML5 video player that includes a Flash-based fallback for browsers that don't support HTML5 media. 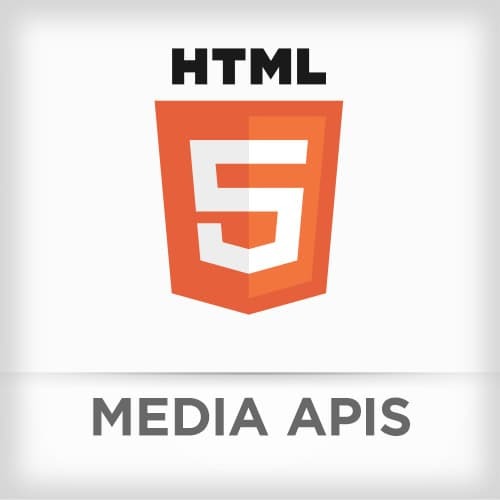 He also discusses the different HTML5 media attributes available. Embed video and audio into a webpage with maximum cross-browser compatibility and a simple fallback. Create the minimal possible markup for an HTML5 web page that contains both audio and video. The audio and video files Mark uses in this assignment were developed years ago. Mark goes off topic for a couple minutes to show some of his first experiments with web audio and video. Mark takes a moment to discuss a few of the media projects he works on. This includes jPlayer and Hyperaudio. There are a lot of tools that will encode audio and video into the correct formats required by HTML5. Some tools are available for download. Others are hosted solutions. In this optional assignment, you should configure your server environment so support the HTML5 media types and encode some of your own media files. Preloading requests the media be downloaded (but not played) as soon as the page is loaded. It can be configured using the "preload" attribute. The buffered attribute will return the time ranges of the media that have been completely downloaded. Playlists are an import user experience element in media players. They are typically marked up using ordered or unordered lists. Building off the previous assignment, you should add a functional progress bar that includes displaying media progress and allowing the user to navigate by clicking on the bar. WebVTT is a standard that can be used for subtitles, captions, descriptions, chapters, and metadata. WebVTT allows for the ability to position text and add speaker semantics. Defining chapters can make navigation easier and more intuitive. Mark also talks a little about browser support for WebVTT. Mark talks about a number of resources for creating and synchronizing subtitles with HTML5 media. A new feature in HTML5 audio and video is the ability to change the playback rate. This API is supported across most modern browsers but still has some gotchas. In this assignment, integrate the playbackRate API into your media player. While Seriously.js can do some amazing effects, the process of creating an effect is simple. Mark shows how to convert a video to black and white in real time. Assignment 6 asks you to manipulate the color of your video using the canvas element. Mark provides some instruction on how to get started with this assignment. WebRTC enabled real-time communication of audio, video and data from browser to browser. To demonstrate this Mark invites attendees into a shared video web application. The three API's enabling this are MediaStream, PeerConnection, and DataChannel. The MediaStream API allows you direct access to devices like the microphone and camera. Audio and video are split into synchronized MediaStreamTracks. Mark overviews the support matrix for WebRTC and gives a number of additional resources as well as a simple code example. While there have been many advancements with HTML5 audio and video, there are a number of limitations. These include issues with autoplay, preloading, short audio, and latency. Mark talks about some of these limitations and how to work around them. Mark starts by demonstrating a few things he worked on for the BBC using the Web Audio API. He then starts describing some of the benefits of using this API. The Web Audio API is very modular. It's node-based approach allows inputs and outputs to be connected by any number of intermediary nodes. Mark ends this topic showing a number of examples that use the Web Audio API. These include audio examples like cross-fading or visual examples like equalizers. Mark answers an audience question about how he synchronizes and stores the transcripts that accompany the video/audio files. Mark ends the course with a couple more questions from the audience regarding his Hyperaudio application.